I’m not shy about the equipment that I love. I’ve practically written sonnets to my Le Creuset 6-quart Dutch oven. I sing along with my 8″ Hammer Stahl chef knife. I swear by industrial baking sheets and Emile Henry bakeware. But I can type so freely about those items because I’ve purchased them. 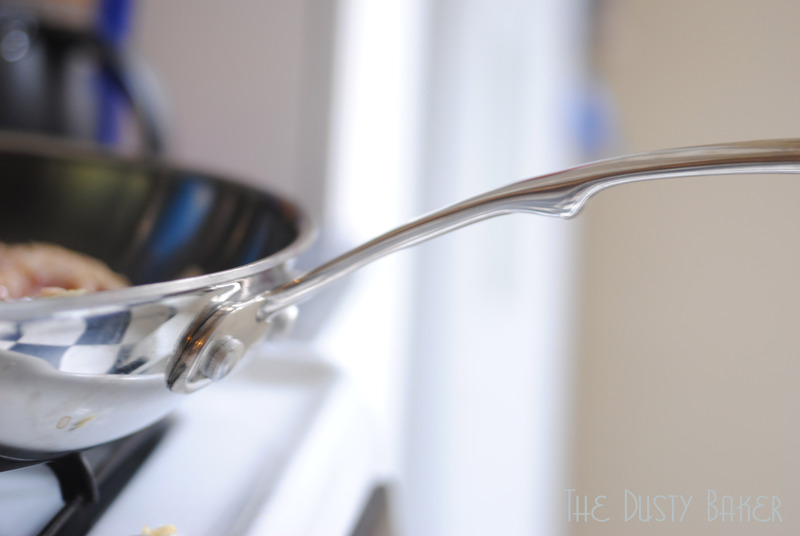 So, full disclosure, I was invited to the HSN launch of the new line of Bon Appetite Collection cookware, and walked away with a 10″ fry pan, a belly full of delicious food and some info on their entire new line. I wouldn’t be blogging about it were I not completely comfortable in saying that I am impressed and am now a fan. Yep, it's all in the details people. At the launch Chef Ryan Scott walked through some of his favorite things about the line which I took into appreciation when making this dish. Two layers of steel wrap around a core of aluminum, providing incredibly even heat to the entire pan, even with my slightly tilted stove. The design is practically seamless, so oil comes up to temperature perfectly. The little hook in the handle is an appreciated touch when you have little hands and a heavy pan. And the weight is incredible, sturdy and even, and feels so hearty that my roommate mourned that we don’t have cheating husbands on whom to fully test its potential. Can trust it from stove to oven as it heats perfectly. Little hook in handle adds extra comfort. Three layers of aluminum and steel gives it the weight and durability of my favorite All Clad pals. The cost is incredibly affordable for such classic and trustworthy elements. No cheating husbands on which to test its bat-like potential. I don’t have a full set of pans and a hanging rack to suspend it on. As far as the rest of the line goes, my wish-list item would be the counter-top pressure cooker. I use my old-school, $20 from a Portuguese supply store pressure cooker for grains, beans and nada else. The pulled pork that they cooked in 42 minutes flat in their pressure cooker… incredible. Juicy and flavorful it contained less sodium and fat because when you pressure cook food more flavor stays in it and therefore you don’t have to add as much into the pot. It’s got a timer, a sleek design and I can see myself using it in many, many ways. Check out the HSN for pricing: I’m impressed by the quality of these products for the prices listed. And each piece of equipment is tested and approved by Bon Appetite and includes some recipes specific to the machine that are incredibly rich and delicious. I recently interviewed Chef Daniel Holzman of The Meatball Shops in NYC for an Easy Eats magazine feature coming out in March, a side-tip of which was, when cooking chicken in skillet, not to get impatient and move it around when it sticks. It will, Holzman affirmed, loosen its grip on the pan when it’s browned properly. In general most chefs I interviewed were aligned with their advice to keep things simple and use top ingredients (check out Easy Eats for some stellar recipes and interviews). So, I have this great new pan, some inexpensive free-range organic chicken thighs and legs, and a new tip to play with. With just a few ingredients and proper technique, here’s how to make flawless, flavorful, juicy chicken… every time. Heat skillet on medium heat for about 5 minutes while you chop onion and garlic. Lower heat to medium/low and add olive oil, swirling to cover pan. Bring up to heat but don’t let it thin / smoke (think medium/LOW heat). Pat the chicken dry and salt and pepper one side. Add onion and garlic to pan and saute for 5 minutes or until just slightly soft. Move onions and garlic to the side of the pan. Add chicken, seasoned side down, in a single layer and brown for about 3-4 minutes. Do not move the chicken until browned up the sides a bit. Season top side with salt and pepper, flip, and brown on the other side. When chicken is just browned, pile garlic and onions around it and throw it into the hot oven. 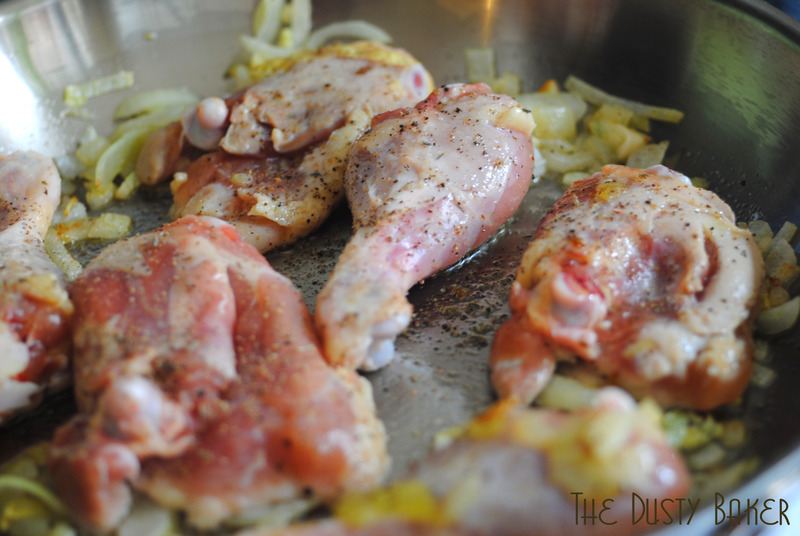 Cook for 10-12 minutes, until the onions and garlic are golden and toasted and the chicken is thoroughly cooked. There, easy peasy. Add garlic and onion powder, lemon pepper, a dash of good vinegar… basics. The result is juicy, perfectly cooked chicken where the poultry sings. That frying pan looks great, love the design in the handle. 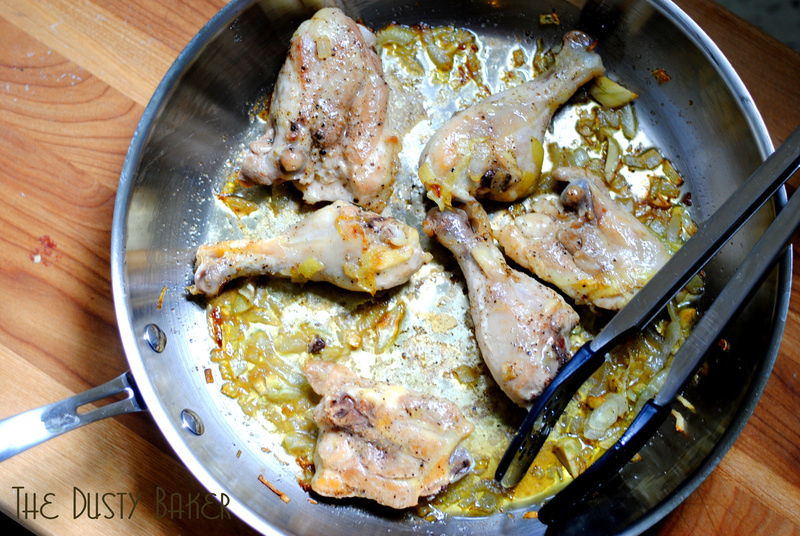 I’d love a counter top pressure cooker…one day ;) Great tips for cooking the perfect chicken…especially not to try and move it around in the pan when it is cooking (and sticking)!